At their best, Loudon Wainwright’s endeavors play like excellent romantic comedies. After all, he has been proven time and again to have a distinctive knack for breaking hearts while causing laughter. Strange Weirdos, his most recent project, is no exception. With producer Joe Henry in tow, Wainwright was about to begin crafting the outing when Judd Apatow asked him to provide material to his latest picture Knocked Up. (Apatow, of course, is a veteran of the smartly conceived television programs The Larry Sanders Show, Freaks and Geeks, and Undeclared, though his biggest claim to fame to date is The 40-Year-Old Virgin). Undeniably, Apatow and Wainwright share a skewed perspective on life — in fact, the duo previously had worked together on Undeclared. Knocked Up’s plot — which revolves around an unexpected pregnancy and the relationship that ensues — is suited perfectly to both of their styles. Still, movie soundtracks and proper albums are different animals with distinctive goals, and rarely do they function completely in synch. Although Strange Weirdos fares better than most like-minded pursuits, it is impossible not to wonder if Wainwright’s initial vision for the set was diluted when his songs were co-opted for use in Knocked Up. For the record, there’s nothing inherently wrong with his new material. In fact, his cinematic depictions of life in southern California — most notably, on Valley Morning and Grey in L.A. — rank among the best of his career, and he delivers Peter Blegvad’s Daughter as if he had written it himself. 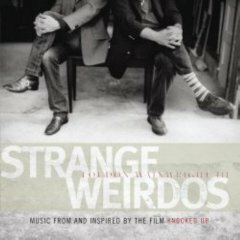 While Strange Weirdos’ title alone is enough to make one crack a smile, the tune that bears its name also contains this stabbing realization: "If I let you know me then why would you want me? But each day I don’t is a shame." It is a commentary that not only serves Knocked Up’s storyline of two people who have been thrown together by fate, but also captures the paradoxical stumbling block of a great many relationships in real life. Strange Weirdos: Music from and Inspired by the Film "Knocked Up"